Just recently I asked a group of educators to “embrace the mess” that comes with learning something new. We are preparing to implement a new program which involves new approaches to teaching mathematics. I talked about how we have to move outside of our comfort zone in order to grow and get better, because that is what will help our students grow and learn. Part of that mess that I invited them into involves making mistakes, mistakes that lead us to greater learning. Reframing a mistake as an opportunity for learning can have a powerful impact on the learner. Mistakes are opportunities for learning. Brain research has taught us that when a person makes a mistake a synapse happens in their brain, creating a dendrite. The dendrite is evidence that the brain is growing and learning. 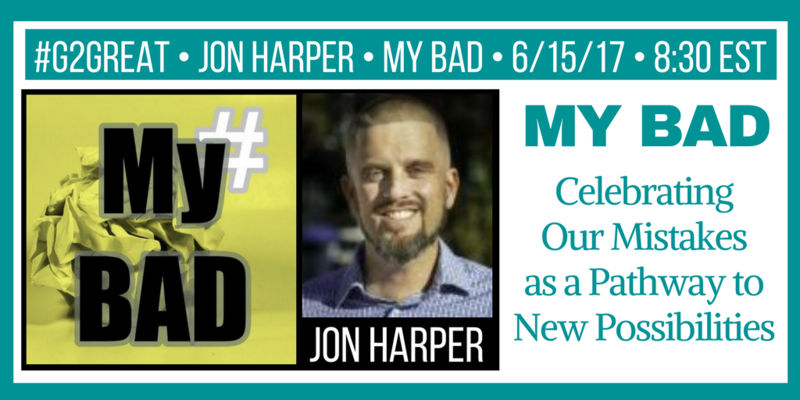 On June 15, 2017 #G2Great welcomed Jon Harper as a guest host to lead a conversation around learning opportunities that come from mistakes. Jon invites guests onto his podcast My Bad to share their mistakes and to explain how those mistakes led to new learning opportunities. This was the perfect complement to #G2Great where we are always striving to move from Good to Great Teaching in the spirit of Dr. Mary Howard’s book which is the heart of our Twitter community. Jon’s tweet below emphasizes not only the mistakes but how important it is to share those mistakes with others. He talks about how this lifts the weight off of our own shoulders. The more transparent we are about our own learning, the more comfortable everyone becomes with sharing mistakes. This creates a safe environment where we are no longer afraid to take the risks that are necessary for learning. Sharing our mistakes with our students gives them the opportunity to see that everyone makes mistakes and that in fact, that is how we learn. If we talk through our mistakes and our students learn how to do that while receiving feedback they can experience the learning process in a very transparent way. As Jon points out we have to be willing to “step first” and be open about our mistakes, others will follow. Once an open and safe environment has been created to embrace mistakes, leaving some space after a mistake can provide time for the learner to reflect and work through the mistake. This is powerful because only one’s own brain can create a dendrite — it is not something a teacher can do for a student. Inviting that time for processing and reflecting on their own mistakes is critical to the learning process. Allowing ourselves to be in situations of new learning where we feel uncomfortable is important so that we do not lose the perspective of the learner. As Jon pointed out in this tweet, we have our students in these situations every day, we have a responsibility to empathize with their feelings so that we can provide the supportive environment that welcomes the messy process of learning. The world we live in places pressures on us to be perfect, be smart and to only value the product. As Jon points out this creates a culture where people are scared to show their imperfections. We need to be vulnerable, we need to accept imperfections and approximations. We need to embrace the approximations that come with growing and learning.